Zinus Mattress Review - Memory Foam under $400? This lets you pick the mattress that best fits your sleeping preferences. I received the 12”, the company’s second-softest model. I have reviewed one of their mattresses before, and I was impressed by the comfort and value. So I was excited to try out the Cooling Gel Memory Foam Mattress. Will you save money and sleep well on the Zinus Cooling Gel Memory Foam Mattress? Read on for my full review. Note: Zinus offers many different mattress models. We received the Zinus Cooling Gel Memory Foam mattress to review. They have four firmness options, and we reviewed the 12″ model. You are looking for a couples mattress. The Zinus has a thick layer of memory foam on top. This material does a great job of isolating motion, so you shouldn’t feel your partner’s movements on your side of the bed. You want a value mattress. Considering how comfortable the mattress is, the Zinus is very affordably priced. While it might not be the longest-lasting mattress, it is a very good deal for a nice memory foam mattress. You are a side sleeper. The 12” Zinus model is a great match if you sleep on your side. It features good pressure relief, and it is very comfortable overall. You should sink into the memory foam and feel little pressure on your shoulders and hips. You are looking for options. Zinus offers four firmness options: an 8”, 10”, 12”, and 14” mattress. Each mattress has a different firmness, so you should be able to find the right fit for you. I tried the 12”, which is ideal for side sleepers. However, if you want more support, you could look at the 8” or 10” models. You are looking for a long-term investment. The Zinus is not constructed with very durable materials. While the mattress is very affordable, it might not last for a very long time. If you want a longer-lasting mattress, consider something with higher-density foams and possibly coils. You are a heavier person. If you are a larger person, the Zinus might not give you the support you need. 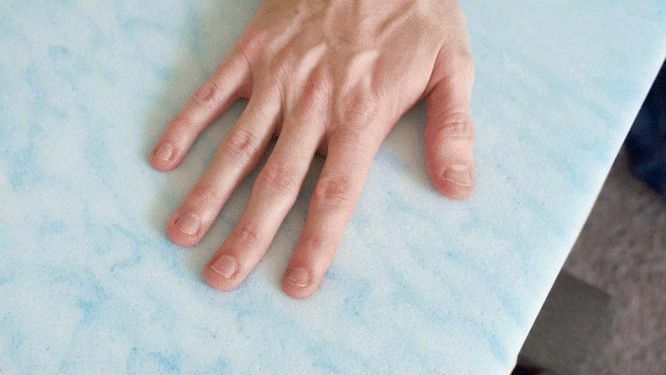 It is an all-foam mattress without coils or other supportive features. Heavier people should think about a hybrid or innerspring mattress. You don’t like a classic memory foam feel. When you lie on the Zinus mattress, you slowly sink into the mattress. It really has that quicksandy, memory foam feel. If you don’t like the feeling of slow-reacting foam, you might want to look elsewhere. The top layer is 3” of gel memory foam. Next, there is a 2” transition layer. This is followed by a 3.5” layer of high-density foam. Finally, there are 3.5” of a high-density base support foam. There are four firmness options: the 8”, 10”, 12, and 14”. All the mattresses are available in Twin, Full, Queen, and King. The 12” and 14” are also available in California King. The base foam layers are convoluted, so they have air channels cut into them. This allows for air to flow through the mattress. The top layer is infused with gel, which also helps with cooling. Altogether, you shouldn’t be sleeping too hot on the Zinus. Adding together the top layer of gel memory foam and the transition layer, there is about 5” of comfort material. This means you will sink pretty far into the mattress. The gel memory foam is slow to respond. If you push into it, it will take a few moments for it to fill out again. The mattress really has that classic memory foam feel. It is worth noting that each version of this Zinus mattress is going to have a different firmness. Looking specifically at the 12” model, the firmness is close to a 6/10. With this model, you get 3” of gel memory foam on top followed by a transition layer. 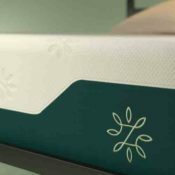 You really get to sink into the mattress, so the Zinus feels softer than average. While lying on my back, I feel decent support. The memory foam conforms to the shape of my body, and I don’t feel my hips sink in too far. However, I will say that heavier back sleepers might prefer the 8” or 10” models. While side sleeping, I feel great pressure relief. Again, there are about 5” of comfort layer, so I really sink into the mattress and feel the pressure on my shoulders and hips melt away. This model is really a great fit for side sleepers. If you want even more pressure relief, the 14” is worth considering. When I am sleeping on my stomach, the mattress is too soft for me. I am not getting the support that I need, and my hips are bowing in somewhat. Stomach sleepers might want to look at one of the firmer models. This mattress has that classic memory foam feel. While it feels a bit firm at first, the mattress slowly responds to my weight and lets me sink in. There is no real bounce, so it is a bit difficult to move around on the mattress. 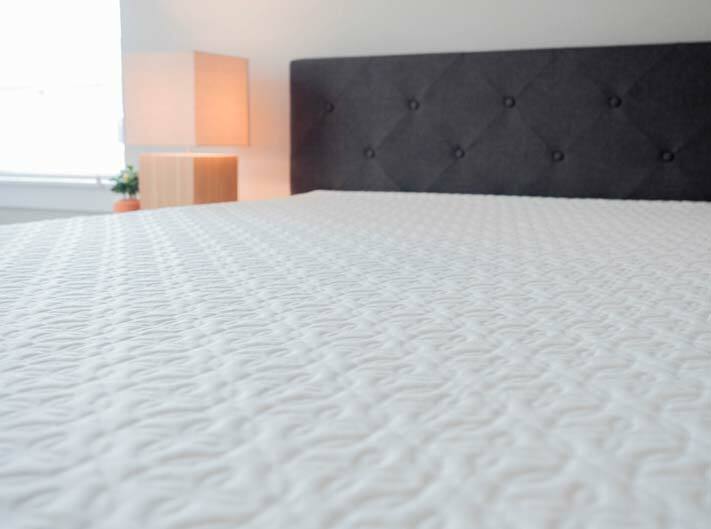 When it comes to handling motion transfer, memory foam is really one of the best materials. Because of this, I was not surprised by how well the Zinus mattress performed during my tests. I placed a glass of water on the mattress and pressed into the surrounding area. The water was barely disturbed. Also, when Marten moved around on the other side of the bed, I could not really feel his movements. If you sleep with a partner, you shouldn’t feel them moving around at night. The Zinus should be a great mattress for couples. While memory foam is great with motion transfer, it doesn’t always have the best edge support. After lying down and sitting down near the edge of the Zinus, I can say this is true for this mattress. When I’m sitting down on the edge, the mattress collapses quite a bit, and I don’t feel very secure. Also, when I am lying down, I feel a bit like I might roll off the mattress. Overall, the edge support is not great on the Zinus. In terms of firmness, Joe said it was a 6/10, while I thought it was closer to a 7/10. I think that’s because, as a larger person, I’m pressing further into the top foam layer and feeling more firmness than Joe did. Starting on my back, the mattress is a little too soft for me. It’s not supportive enough, and my hips are sinking in a little too far. I am feeling some support on my lumbar area, but overall, I am sinking into the mattress. On my side, I feel a little pressure on my shoulders and hips. It’s not too much but, if you are larger than me, you could feel even more pressure. When I move to my stomach, the mattress is not supportive enough. I’m bowing in at the hips and feeling myself get out of alignment. If you are a heavier back sleeper, and you are a little lighter than me, this could work for you. If you are heavier than me, look for a firmer option. If you are a heavier side sleeper, it could be a good option. If you are a heavier stomach sleeper, definitely look for something firmer. Marten’s experience is not very surprising. Like me, he thought the mattress was too soft for stomach sleeping. Also, as a larger person, he could have used a bit more support on his back and pressure relief on his side. People of Marten’s size or larger should look at one of the firmer models. The Zinus is a bed-in-a-box mattress, which means it will come compressed and shipped straight to you. You will want to begin by removing the rolled up Zinus mattress from its box. Then, preferably with another person’s assistance, position the roll on your bed. Carefully cut away the first layers of plastic until the still-compact mattress can be laid down flat. Then, pierce through the final layer of plastic and the Zinus will expand. Simply clear away the excess plastic and allow your mattress to breathe and fully expand. There are many firmness options to choose from. You should be able to find the right firmness for you. It is a very affordable mattress that is also very comfortable. The 12” model should be a great option for side sleepers. The Zinus has that classic memory foam feel where you slowly sink into the mattress. The memory foam cuts down on motion transfer, so you shouldn’t feel your partner moving around at night. It is a great mattress for couples. Zinus is perhaps the best valued mattress I have tried at the lower price point. I had a very comfortable sleep experience on this memory foam mattress. If you are looking for a comfortable memory foam mattress, and you want to save some money, the Zinus Cooling Gel Memory Foam Mattress could be a great choice for you. However, those who want a long-term investment and/or prefer to sleep on top of their mattress should look elsewhere. The mattress comes with free shipping and returns, a 100-night trial, and a 10-year limited warranty. So happy i came across your video and post. I am having the HARDEST time with purchasing a memory foam mattress because i was unsure on its firmness and reviews some people say firm some say soft. Online (walmart) its considered medium. Currently we have a memory foam mattress thats from Wal-mart and we’ve loved it but its 10yrs old so its time for a new one. When i lay on our current mattress it forms to my body a bit and comfortable. Problem is we’re unsure what the firmness of this mattress is https://www.walmart.com/ip/Spa-Sensations-by-Zinus-12-Inch-Eco-Sense-Memory-Foam-Mattress/285021324. Would you say the Spa Sensations by Zinus 12 Inch Eco-Sense Memory Foam Mattress would be close to my current mattress based on my amazing description (lol) ? For example the one you’re on would you say its firm but soft? I hope im making sense. I haven’t reviewed that one actually. I have just ordered the comfort memory foam mattress off of Amazon. I bought one back in June, however, this mattress is so firm it feels like I’m sleeping on a board. I’m ordering a new one and if isn’t any better, I’m sending it back. I’m an older person and had a hip replacement years ago, and I get up in the mornings and every bone seems to be hurting. Advice please! We purchased an Serta icomfort plush and got about 2 years out of it before it started hurting both of our lower backs. I ended up getting a lower priced memory foam mattress about a year ago as a short term fix but have been waking up with Sciatica pains again the last couple of weeks. I recently slept on a Zinus memory foam mattress as a guest and absolutely loved it. My only concern is what it’s longevity will be. So is there something you could recommend that would have a very similar feel to a Zinus but maybe a little higher quality? I am a side sleeper but think I do better with a mattress a little more on firmer or med/firm spectrum. Try the Loom & Leaf if you don’t think it’s out of your budget range. Hi! I currently have a queen size 12 inch Zinus mattress and I love it. I’ve had this mattress for nearly three years and it is just as comfortable as when I bought it! It’s just like new! We are upgrading to a king size soon and plan to use this bed in a guest bedroom. Hi there, I’ve had the 12” green tea medium-firm. I’ve slept on it two nights, it’s not comfortable. Any advise ? Give it another week. It should soften up a little bit. I have a12” green tea Zinus. I pt a cotton mattress cover on it that fits pretty snug and feel less like I am being enveloped by it. Comfortable sleep. Had it just over a month. I have a hurt back but loved my pillow top bed finally it was done which one would you suggest ? I am currently sleeping on a Zinus Green Tea 12 inch mattress in our guest room and I LOVE IT! However, I would like to purchase something more durable for our master bedroom. Can you recommend a brand and firmness level that would feel the closest to a Zinus Green Tea 12 inch? What firmness did you get? Don’t order from their website! Ordered 8″ Pressure Relief Green Tea Memory Foam Mattress. Tried for couple days and it was very soft for us. Turned out it’s only for unopened boxes, which is not mentioned on the site. They don’t even have return policy for opened mattress on their web site. After contacting them they told me to arrange return pick-up by myself, donate mattress to charity organization. The problem is most of charity don’t pick-up used mattress and none of them will pick up free in our area. Very disappointed! Your review is misleading. If you purchase from Amazon, it appears that you must return it within 30 days (Amazon’s return policy), but if you purchase directly from Zinus, you get the full 100-day trial with a full refund if returned within the 100-day period (Zinus return policy: https://www.zinus.com/pages/shipping-and-returns). In the review under the Construction and Materials section, you state that you tested the 10″ mattress. Yet, the one you describe is the 12″ mattress. Which did you actually test? Thanks for your review. Considering this mattress in queen but not sure what thickness to get. I prefer a firmer feel, and sleep both on my side and my back. Should I go for 8, 10, or 12″? I would do Medium feel 10″. Have you done reviews of other cheap matresses? Like Qomfort? Trying to determine if I want to go with an old fashioned memory foam or opt for a more latex like feel for the responsiveness…. Thanks! I have not yet – planning more later in the year, sorry I can’t be more help now! Puzzled by the difference between Zinus green tea and Zinus green tea with gel. Considering 12 inch. Can you explain? Joe, Thanks for the detailed review, sounds like I should consider Zinus. Which Zinus model did you review? Appreciate your information, very helpful. I ordered the 10″ queen plush and received barely 8″ after expansion. Zinus never answered the phone. Left message and they didn’t call back. Amazon wants to charge return s/h charges for their screw up. So hopefully you all keep that in mind before your next purchase. I do not trust Zinus or Amazon. Hi Gary – sorry you had a bad experience! Did they send the wrong one or did it not expand completely? When one is sitting in the bed there is greater pressure and weight placed in that area. what factor should I focus on when shopping for the mattress? Is it the density, ILD, pounds of foam per cubic in, or anything other than that? Any particular direction I should be looking that would be helpful. If you’re looking at foams, I’d focus on density. This is (in my opinion) the best indicator of durability. I am looking for a mattress for adjustable base. I would like a supportive mattress that would feel supported even in the incline position. I would like to have the opportunity to return it if it does not work for me without a charge and I would like to get the best value and price. . Can you make a recommendation? Hi Miriam – Nearly all of the online-only options allow for returns (at this point there are many).